Andorra, a small mountainous country located in the Pyrenees, between France and Spain, has a temperate climate in the lower valleys, and a mountain climate at high altitudes. Precipitation is quite frequent, since Atlantic frontal systems affect the country for many months a year, while in summer, when the Azores anticyclone prevail, thunderstorms may break out in the afternoon. 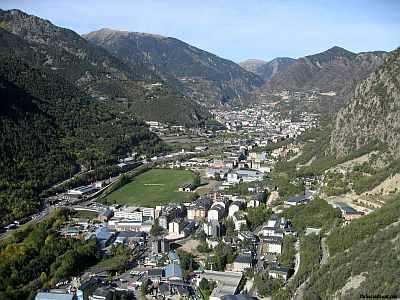 The capital, Andorra la Vella, is located at 1,000 meters (3,300 feet) above sea level, in the Valira Valley, in the low part of the country; the lowest point is Sant Julia de Loria, 840 meters (2,755 feet) above sea level, in the south, near the border with Spain. Here the climate is not too cold: the average temperature in January is 2.5 °C (36.5 °F), while in July and August it's 19 °C (66 °F). Winter is cold but not freezing, although the temperature at night drops quite often a few degrees below freezing. The wind from the north has foehn-like characteristics, that is of a warm, dry wind that descends from the mountains. However, heavy snowfalls and frosts may occasionally occur. Summer is quite warm during the day with highs around 25 °C (77 °F), but relative humidity is not high, and nights are cool. In the afternoon, thunderstorms may occur. Here are the average temperatures of Andorra La Vella. In Andorra La Vella, precipitation amounts to 800 millimeters (32 inches) per year, and it's well distributed throughout the year, although there's a relative minimum in winter and early spring, while the rainiest months are May and June because of afternoon thunderstorms. Here is the average precipitation. In Soldeu, located 1,800 meters (5,900 feet) above sea level, the climate is much colder: the average temperature reaches a minimum of -3 °C (26.5 °F) in January and February and a maximum of 12 °C (53.5 °F) in July and August. An average of 1,300 mm (51 in) of rain (or snow, from November to April) falls each year. There is no dry season because in summer thunderstorms can occur in the afternoon. Here are the average temperatures of Soldeu. The average altitude of the country is 1,900 meters (6,200 feet). In high mountains, snowfalls occur during winter. In the highest peaks, snow can linger on the ground until July. The highest point in the country is Coma Pedrosa, 2,942 meters (9,652 feet) high. The amount of sunshine in Andorra is high in summer, when sunny days are frequent, while it is just acceptable in the other months. The best time to visit Andorra runs from June to mid-September, in fact it is the least cold in the mountains, while in the valleys it's warm, but not too much. You should be equipped for cool temperatures at night in the valleys, and even for the cold at high altitudes, and for afternoon thunderstorms. July and August are the warmest months; July is generally less prone to thunderstorms than August. In winter: bring warm clothing, a sweater, a down jacket, a hat and gloves. In summer: bring light clothes, a T-shirt, but also long pants, a jacket and a sweater for the evening and in the mountains; hiking shoes, sunscreen and sunglasses, a raincoat or umbrella.